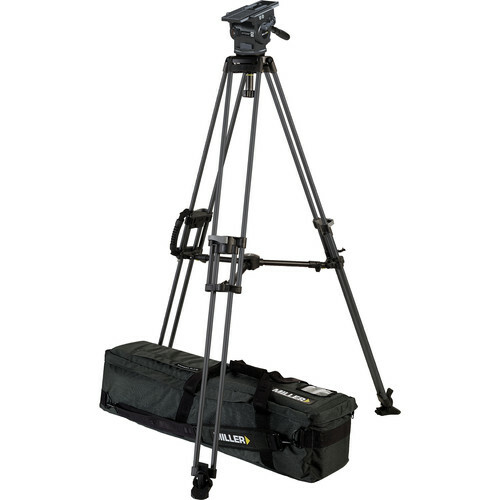 The ArrowX 5 Sprinter II Single-Stage Aluminum Tripod System from Miller includes the ArrowX 5 fluid head, the Sprinter II 1-stage aluminum tripod, a mid-level spreader, a set of tripod rubber feet, and a telescopic pan handle. Also included is an Arrow padded soft case that ensures easy and secure transportation. Suitable from fast-action shoots to long, slow pans, the ArrowX 5 fluid head is capable of supporting ENG and EFP camcorders with 4.4 to 46.2 lb payloads. The Sprinter II tripod has a single-extension design with height adjustment from 26.4 to 56.5". It collapses down to 33.1". The mid-level spreader holds the tripod legs in position, providing rigidity and stability to the overall system. The Arrow X5 Fluid Head from Miller is suitable for use with ENG and EFP camcorders. It offers a 4.4 to 46.2 lb payload range and seven selectable pan-tilt fluid drag positions. It features precision fluid drag with a 16-position CB Plus counterbalance system. CB Plus is a sequential counterbalance design, features eight larger counterbalance steps, allowing you to quickly and efficiently achieve the required counterbalance position. The system's one flick switch located at the front of the head adds a half step between each of the eight larger steps enabling counterbalance fine-tuning when required. The Arrow X5 fluid head features a 100mm ball leveling with three M5 holes for flat base mounting. The pan and tilt locks utilize caliper disc brakes for reliable, short-throw fixing. The Miller Sprinter II 1-Stage Alloy Tripod is a quick-setup solution for a tripod head with 100mm ball base. Its light weight, flip-locks, and rigid construction allow for durability without compromising usability in ENG, EFP, and other pro video applications. The fast setup is complemented by an in-line carry handle, for portability on set or in the field. Compatible spreaders, rubber feet, and dollys are available separately. The Miller 993 is a mid-level spreader for Sprinter, Arrow 25/40 and HD tripod systems. This device offers variable adjustment in minimum and maximum height settings and a latch and swivel design. The Miller 870 Soft Tripod Case is a padded tripod carry case designed for the Miller Arrow single stage tripod systems. It has rigid sidewalls sandwiched between high density foam padding and a head-end cradle to protect the tripod and fluid head from heavy bumps during flight and vehicle transport. It has a weatherproof Cordura construction with heavy duty zippers on the bag and the 2 interior pockets. The case is carried by either the padded interlocking carry straps or the padded shoulder strap. Box Dimensions (LxWxH) 16.3 x 14.0 x 11.5"
Box Dimensions (LxWxH) 37.0 x 13.0 x 10.5"
Box Dimensions (LxWxH) 18.35 x 6.55 x 6.4"
Box Dimensions (LxWxH) 18.45 x 6.6 x 6.35"
Box Dimensions (LxWxH) 44.5 x 10.8 x 10.7"